Paging all Hunters, hop into Monster Hunter: World right now and tackle the newest monster, the golden Elder Dragon Kulve Taroth. This one's a little special, though; it won't just be you and three of your buddies this time around. Kulve Taroth is an especially "big boi" and thus 16 players must team up to bring him down and craft new gear from his sparkly hide. The announcement of this new "Siege" event came via the Capcom Unity Blog yesterday and along with the event there will be a content update (full notes here). Based on the language in the announcement, it doesn't seem like you'll be able to join in on this special hunt via the usual "Respond to SOS Flare." Instead, you'll either need to gather up all 16 members of your Squad at one time, or join specific Kulve Taroth sessions. Hunters are then divided up into four groups comprised of four hunters each, and while each hunting party will act independently in their own "instance" of the fight, all of the damage/investigation/part-breaking that's done to Kulve is pooled together across all of the hunting parties and all parties will get credit. 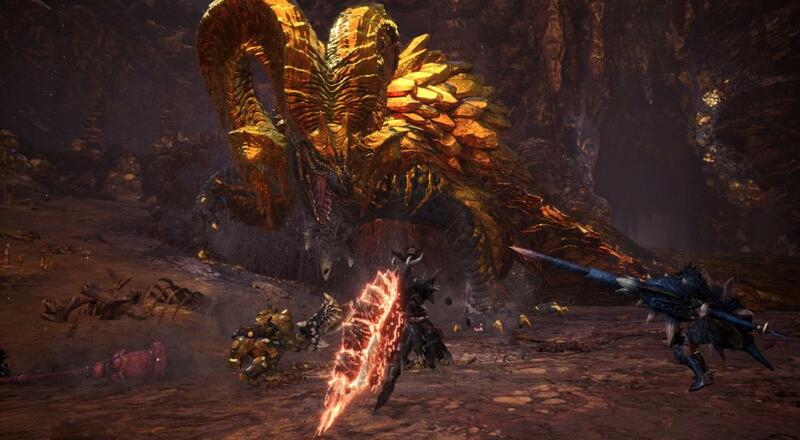 The blog post also hints that Kulve's "golden mantle happens to be a collection of shiny weapon relics it has gathered along its journey through the New World," so in addition to the new armor and weapons you'll get from the materials you'll harvest from bringing him down, there will also be random weapon drops? The content update should have hit earlier today and be available to download now (if you haven't already). This "Siege" event will be available until May 2, but it will cycle in out like other limited time events in Monster Hunter: World. Page created in 0.2759 seconds.